Rule R7e states a 12" by 24" sheet of polycarbonate can be used. What is the inspection process to insure teams are not exceeding that 2 sq ft limit? I have seen many robots that look to exceed that limit (even at Signature Events) and with States coming up soon, we want to make sure all teams (and ourselves) are in compliance. Even US open I haven’t seen check plexi amounts. Keep in mind that the rule is not “2 square feet max”, it actually has to be possible to make it from a 12" x 24" sheet. If you have concern that the inspector might question amount of legal plastic (polycarbonate is not Plexiglass, by the way. Plexiglass is a trade-name for Acrylic or PMMA, which is illegal), you should prepare a drawing or sketch that shows how the sizes and shapes of the pieces you’ve used will fit on the 12" x 24" sheet. Bring the drawing with you to inspection and there should be no problem. @Jayden_Siegle what Game was at the US Open for VEX IQ that allowed plexi? @kmmohn Your answer doesn’t make any sense for VEXIQ. Or is it possible that you are all lost and once again posting in the wrong set of Forums? This is VEXIQ. On our Robot High quality, we used a lot of polycarbante. 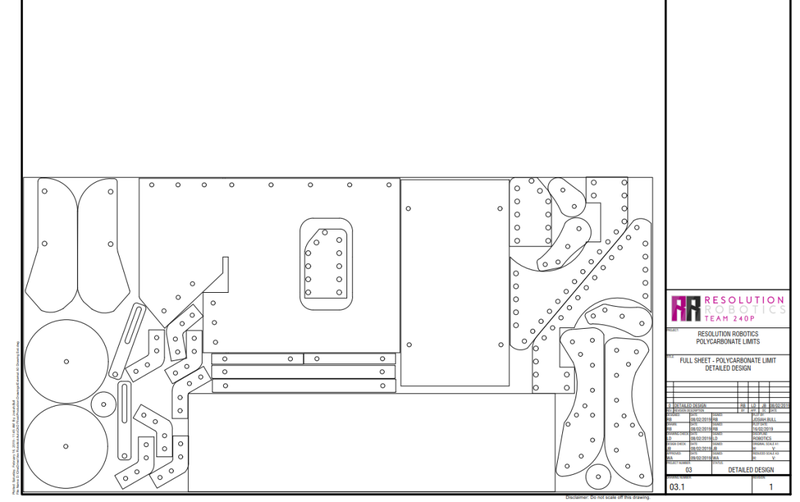 As we used Inventor to cad our robot beforehand, we were able to create the part and test it. This allowed us to create a drawing of the part and add it into the sheet. In order to print out the sheet we had to scale it down from 1:1 to 1:3. I have included a photo. Your use of polycarbonate was really great! Did you hand cut it, or use another machining process? Everything was hand Cut, we used tin snips to cut it. I printed out a 1:1 scale of the drawing of the part and glued it into the lexan. This gave me a clear line into where to cut, giving me precise cuts.